These Salted Caramel chocolate chip cookie bars from Lemons for Lulu are buttery, sweet, crunchy and chewy. They are the perfect treat any time of day! 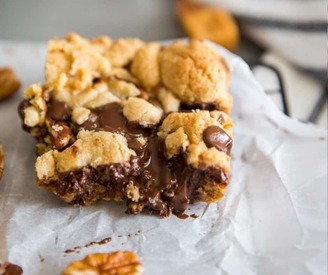 What are chocolate chip cookie bars? Simply put, they are basic chocolate chip cookie dough baked into a 9 x 13-inch pan. They are soft and gooey just like your favorite cookie but they are served up in big squares that beg to be served with a tall glass of milk. Chocolate chip cookie bars can handle almost any “extra’s” and ingredients swaps you’d like to throw at them. Change out the chips and use butterscotch or white chocolate chips instead of the chocolate chips. Candies like M & M’s, chopped Snickers or Reese Cups would be wonderful as well!